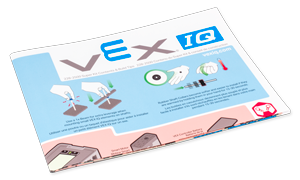 These printed documents were all created to be learning tools for the VEX IQ system. 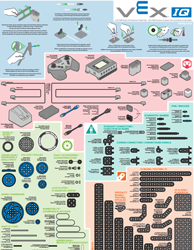 Use these materials as guides for building your VEX IQ robots! Note: All of these materials are included when you purchase a Starter Kit or Super Kit. 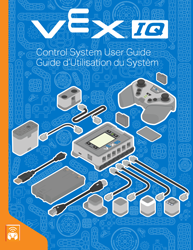 The Control System User Guide provides guidance in learning the VEX IQ control system basics. 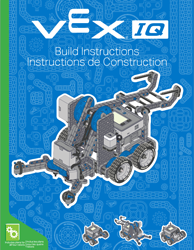 Use these instructions with a Super Kit or Starter Kit to get started building and programming VEX IQ robots. 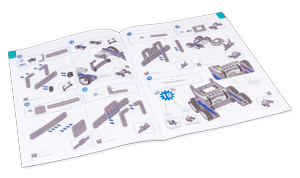 Use these instructions with a Super Kit or Starter Kit to build your own Clawbot IQ! Four different robot variations can be built with these instructions. 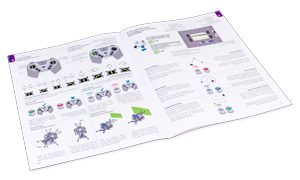 Use the Super Kit Contents & Build Tips Poster as a 1:1 reference while building your VEX IQ robot. A 1:1 reference can be useful when comparing parts such as different angle beams or identifying gears with varying tooth counts.